Read our comprehensive prediction on who will win today? In Today’s Dream11 Fantasy Cricket Match Prediction LAN vs LEI 31st May English ODD Cup, 2018, we will cover likely playing 11, toss prediction and pitch report of Oakham School Ground, Oakham. We will also cover players recent and past performance, dream11 best teams, weather report of Oakham, all the latest news and updates of Leicestershire and Lancashire, key players, the best choice for captain and vice-captain, dream 11 guru and crictom experts prediction, where to watch the live match of LEI vs LAN and details of live streaming of Royal London One Day Cup, 2018. All the details and statistics are taken from very reliable sources. Make sure to read the complete post to get 100% benefit. All the details and statistics in this post are absolutely free of cost. You don’t have to pay a single penny. Read each and every section of the post as we provide tips, tricks and suggestions of fantasy leagues in each section. Our strategy is very simple. We predict, the players perform and our readers win. To win any fantasy leagues, you should have the above information and the best part is we provide you all the details absolutely free of cost. You just need to read the complete post to get all the crucial information and make your perfect team. Luck is one of the most important factors, that’s the reason we ask you to make your own teams by reading the whole article. The information that we provide will make you ahead of 80% of the fantasy users. Where Can You Watch the Live Streaming of LEI vs LAN or Channels to Watch? Who Will Win the 31st May Match of Royal London One Day Cup, 2018 Between LAN vs LEI and Toss Prediction? What is the best combination of players for Dream11 and Fantasy Leagues for 31st May Match? Date: The match will be played on 31st May 2018 (Thursday). Match: Royal London One-Day Cup, 2018, LEIC vs Lancs, North Group. Venue: Oakham, Oakham School Ground. Time: 10:00 AM GMT, 03:30 PM IST. Oakham School Ground will witness the first match Royal London One Day Cup today. The pitch is expected to be a batting beauty. The wicket will have a good and even bounce. The batsmen can easily play on the rise shorts. The seamers will get some initial swing from the wicket. The wicket will have something for everyone. The spinners will get a little bit of turn and bounce. The match will be a high scoring game as the ground has a quick outfield. Note: If you know how the pitch will play, then you can select your team according to the pitch. Make use of the pitch while selecting your team for fantasy leagues. From the above pitch report, you would have understood that keeping fast bowlers in your team would be a wise choice. In the morning, it will be mostly cloudy but no rain is expected but in the latter half of the day, there will be a rain and it will continue throughout the day. It is expected the cricket fans and fantasy users will get a game of reduced overs. The temperature is expected to be 17-Degree Celsius and the humidity to 90% which may go down to 73%. In the last five matches, Leicestershire won two matches out of five matches whereas Lancashire won three games out of five games. LEICS have won the last two games back to back against LANCS. The last match they played against each other, LEI defeated LAN by three wickets with four balls remaining. You can watch the live match of Leicestershire vs Lancashire, North Group on Sky Sports. You can watch here, the live streaming of LAN vs LEI on 31st May. The cricket fans can watch the complete live match on Sky Sports Channel. 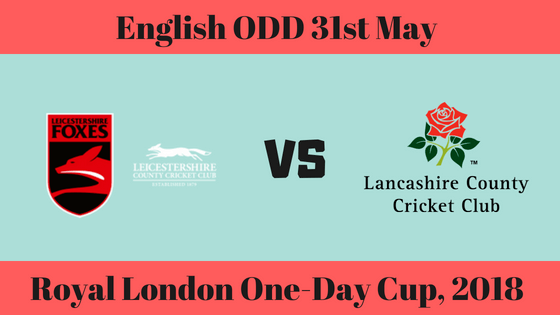 In this section, we will provide you with the squad of Leicestershire vs Lancashire for English ODD Cup. Paul Horton (c), Mark Cosgrove, Neil Dexter, Varun Aaron, Ned Eckersley (wk), Tom Wells, Cameron Delport, Callum Parkinson, Lewis Hill, Colin Ackermann, Ateeq Javid, Harry Dearden, Dieter Klein. Josh Bohannon, Steven Croft, Graham Onions, Dane Vilas, Karl Brown, Liam Livingstone (C), Rob Jones, Haseeb Hameed, Stephen Parry, Alex Davies, Matt Parkinson, Joe Mennie, Jordan Clark. Both the teams are at the both of the points table and they will definitely like to improve their rankings. Lancs played 5 matches, won one match and lost three. LAN has three points in their pocket. Leics also played 5 matches, won one and lost four. Lan has two points in their pocket. It will be interesting to see how they make their playing 11combinations. We will provide you with the probable playing 11 in the next section. After winning the first game, LEICS have lost their four matches back to back. Most of their batsmen are performing but they failed to win. LEI captain (Paul Horton) has contributed the most for their team. Lewis Hill and Harry Dearden will replace Gavin Griffiths and Ben Raine. Nixon, the head coach of Leicestershire may consider Ateeq Javid and Dieter Klein. Colin Ackermann, Varun Aaron, Ned Eckersley (wk), Mark Cosgrove, Tom Wells, Paul Horton (c), Callum Parkinson, Harry Dearden, Cameron Delport, Lewis Hill, Neil Dexter. LAN have lost three games and won only won. Keaton Jennings, the top scorer of Lancashire has been called for national duty so he will not feature in today’s match. Liam Livingstone (Captain) will have to make a force change as Keaton Jennings has joined England Team for the test match. Either Haseeb Hameed or Rob Jones can play in place of Jennings. Dane Vilas (wk), Graham Onions, Josh Bohannon/Stephen Parry, Karl Brown, Alex Davies, Steven Croft, Liam Livingstone (c), Joe Mennie, Matthew Parkinson, Jordan Clark, Rob Jones/Haseeb Hameed. Pro tips: Both the players are good. Ned has scored 130 runs in the last four innings whereas Dane Vilas has scored 131 runs. 42.54% of the users have selected Vilas in their dream team and 47.5% have selected Ned Eckersley. Make a combination of the above players for multiple teams. Pro tips: The above batsmen are most likely to score runs today. Make a combination of the above players for multiple teams. Pro tips: The above all-rounders will contribute the most today. Either you keep all three players or make a combination of the above players for multiple teams. Pro tips: The above bowlers are most likely to take wickets. Make a combination of the above player for multiple teams. Both the teams are similar and have won equal matches. LEI have beaten LAN in the previous two games and has an upper hand. According to our prediction astrology prediction, LEICS will win in today’s match. The team winning the toss should opt to bat first as rain will come into the play in the latter half of the game. According to our astrology prediction, LEI will win the toss and ask LAN to bowl first. As the pitch may support the batsmen and it could be a high scoring game try to take more of a hard hitters. Alex Davies and Paul Horton are must have players. Try to take all three all-rounders as they will contribute with the bat and ball both. Conclusion: This is it for Today’s Dream11 Fantasy Cricket Match Prediction of LAN vs LEI, ODI Match, Royal London One Day Cup, 2018, which will be played on Thursday 31st May. You can give your valuable feedback in the comment section. Subscribe to our notification of latest updates. GOODBYE!